From I-5 South take exit 58, the first Grants Pass exit. This puts you on 6th Street. Follow 6th Street all the way through town. After you cross the Rogue River bridge you go through three traffic lights. The third light is at the intersection of Highways 238 and 199 (6th street ends and Hwy 238 begins here). Go straight through the intersection and follow the signs to 238 toward Murphy and Medford. Stay on 238 through Murphy. As you leave Murphy, you will see a grocery store on your right, H Market. Approximately 6.3 miles beyond the store you will come to a fork; Hwy 238 curves to the left and Watergap Rd. begins straight ahead of you. You will see an Applegate Valley Fire Station to the right of the fork. Continue straight onto Watergap Road and follow it 2.3 miles. Pacifica is the first driveway on your left after passing Dreamhill Road. You will see a big gate with a “Pacifica” sign and a green-roofed kiosk. Turn left onto the property and come down the road a half mile to the large brown building on your right. Pacifica’s offices are in this building to the left of the large glass door. 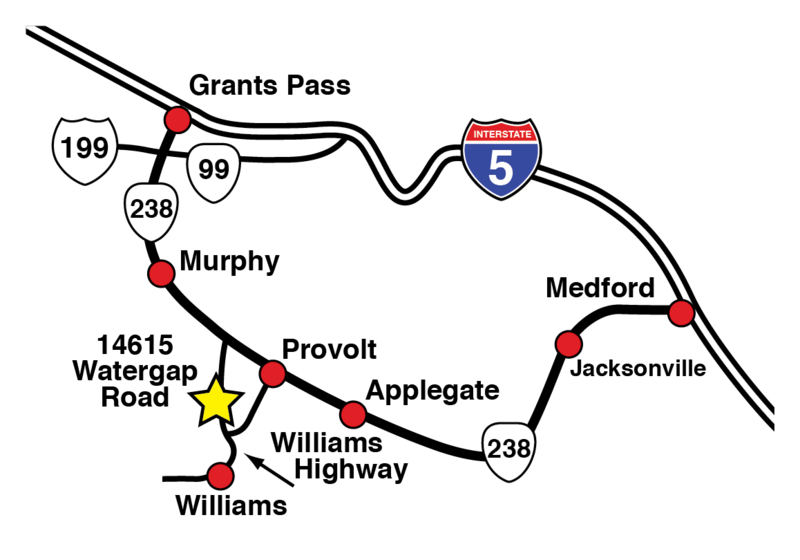 Take Highway 238 west from Jacksonville toward Ruch, Applegate, Provolt, and Grants Pass. Approximately 2 miles beyond the Provolt Store you will come to an intersection. You will see an Applegate Valley Fire Statoin right in front of you. Turn left onto Watergap Road from 238 and follow it 2.3 miles toward Williams. Pacifica is the first driveway on your left after passing Dreamhill Road. You will see a big gate with a “Pacifica” sign and a green-roofed kiosk. Turn left onto the property and come down the road a half mile to the large brown building on your right. Pacifica’s offices are in this building to the left of the large glass door.